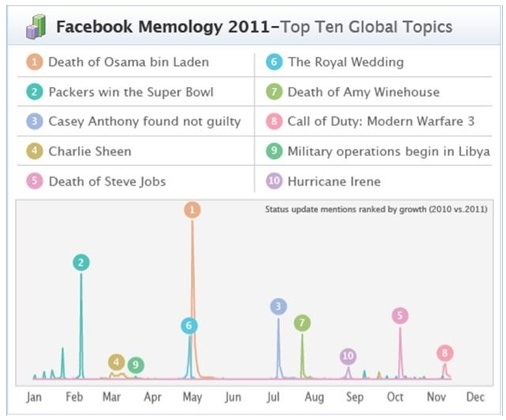 The social barometer that is Facebook has released its most talked about topics for 2011. The data shows the top ten Facebook status trends for 2011 by key countries and globally, as well as fastest growing Pages (from musician and actor categories) and most popular media on a global level. Most talked about brands and most successful brand Pages were not made available by Facebook. The most shared items of the year globally were published on Mashable, but unavailable at a local level. Planking, where people lie face down in unusual locations, was the runaway viral success (for society? – Ed) in Australia for the year, topping the Facebook meme list and ranking third amongst ‘what is…’ searches on Google’s most searched queries for 2011. 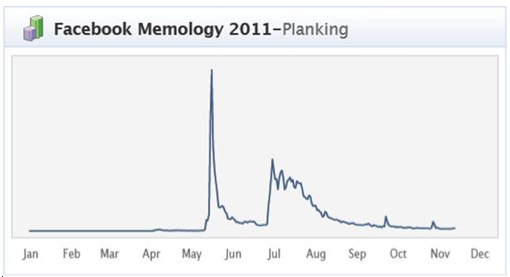 Status updates mentioning planking exploded in May. According to Facebook, that happened after Max Key, the son of New Zealand Prime Minister John Key, posted a Facebook photo of himself planking in the family lounge with his father in the background. The stickiness of the phenomenon appears to have originated from a well connected source. The campaign for the 2011 Australian census also registered as a success, elevating the event into third place on the meme list. Central to the engagement campaign around the survey was ‘Spotlight’, an interactive tool that published a personalised infographic to the user’s Facebook wall. Events in the UK and US had the greatest influence on the global memology. The most talked about event of the year was the death of Osama bin Laden, the biggest sports event was the Super Bowl and the biggest product launch for 2011 (and all time) was for video game Call of Duty: Modern Warfare 3. Charlie Sheen captured people’s attention in March, when his trademark ‘winning’, ‘tiger blood’ and ‘goddesses’ memes took off. The marriage of Kate Middleton and Prince William dominated the conversation in April, with mentions of the phrase ‘Royal Wedding’ shooting up nearly 600-fold in the days running up to their wedding day. And the year was also marked by outpourings of sadness and memories after the deaths of Amy Winehouse in July and Steve Jobs in October.